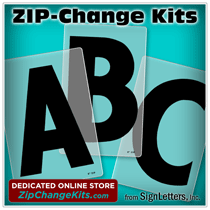 The Injection Molded Plastic Sign Letters are available in the assortment of letter heights shown in the listing below. After choosing the size from this availability listing, you will be presented with the various typefaces which we offer in your selected size. Some injection molded plastic letter styles will only be available in a few sizes. If you don't find the style and size combination you are needing in our Minnesota injection molded sign letters, you may want to check out our formed plastic sign letters selection. Formed plastic letters will not have the same "sharp" sides of a Minnesota Brand injection molded plastic letter. These high quality molded plastic sign letters are produced by experienced craftsmen at Gemini, Inc. (the world leading manufacturer of architectural signage) and will add a professional touch to your dimensional letters. These injection molded plastic sign letters are routinely used on building signage, either indoor or outdoor.